Two top drivers added to their impressive resumes of recent accomplishments over last weekend, continuing their prowess for making big news. Justin Bonsignore won his fifth straight NASCAR Whelen Modified Touring Series race Sunday at Thompson (CT) Speedway and in the process got his title-defending season on track. Bonsignore’s win was his fifth straight Mod tour win at Thompson, an all time record. Bonsignore’s winners’ check was $10,000. Matt Sheppard won back to back Dirt Modified features, at Grandview (PA) Speedway in the rich Money Maker 50, then, in a different car, roared to the Short Track Super Series checkered at Orange County (NY) Fair Speedway in the 50-lap Hard Clay Open. Sheppard netted close to $20,000 for the two wins. 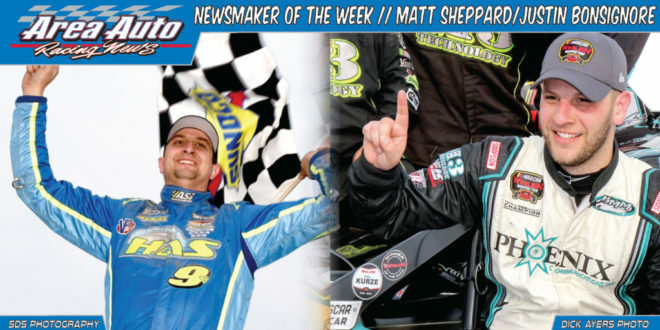 For excelling at the highest level on both asphalt and dirt, Justin Bonsignore and Matt Sheppard have made waves in the sport – and are both Newsmakers!